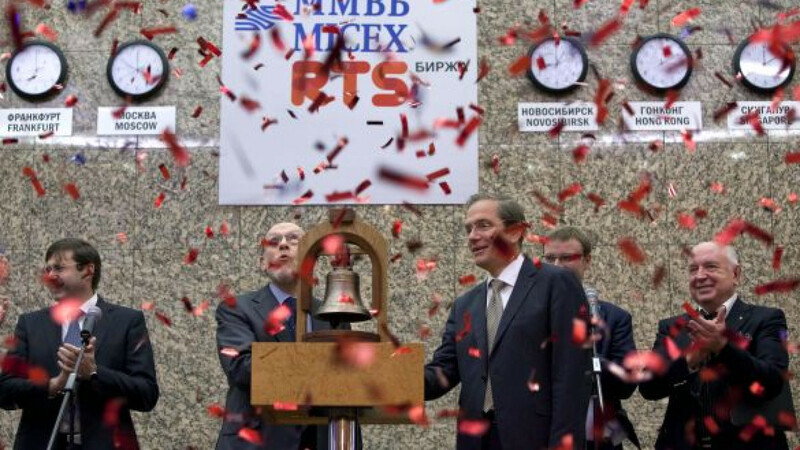 With the ring of a bell and a salvo of red and blue confetti, trading on the merged MICEX-RTS bourse started Monday in a major step toward turning Moscow into an international financial center. Merging the two bourses' businesses to establish a combined company of $4.5 billion in capitalization is just the first milestone in an integration that is expected to be fully completed over the next two years and result in a surge of interest in the country's financial market among domestic and foreign companies. "The merger creates a one-stop shop for local and international market participants to trade equities, bonds, derivatives and currencies," the joint company said in a statement. "The merger also clears the way for further reforms that are necessary to establish Moscow as an international financial center," the statement said. Creating a combined stock exchange that will become "a single platform for issuers, traders and investors" will be beneficial for all market players because it will simplify trading and reduce transaction costs, it said. As a result, more international companies doing business in Russia might seek to invest domestically, with the fixed income market being the first to see new demand, said Ruben Aganbegyan, president of MICEX-RTS. "The demand will come from international companies operating in Russia. They need to finance these operations, they are developing their brands, becoming known to our market, and they need to raise funds on our market," he told a news conference after the ceremony to launch trading. Aganbegyan also said he expected the equity market to see interest from foreign investors as time goes by. Foreign investors are unlikely to feel the effect from the merger immediately, but the move will facilitate their access to the Russian market in the medium term, said Sergei Yezimov, portfolio adviser with Wermuth Asset Management. Foreign investment funds, which currently can't open accounts directly in the securities depositaries that have been used to serve the two stock exchanges' clients, will be able to do so, Yezimov said. But it will only be possible after the establishment of a central securities depositary to replace the National Settlement Depositary and the Depositary Clearing Company, he said in e-mailed comments. Central Bank Deputy Chairman Sergei Shvetsov said after the ceremony that he expects the Federal Service for Financial Markets to accredit the central depositary by April 1. The law creating the central depositary passed by the State Duma last month goes into effect Jan. 1. Analysts said that establishing the central depositary would eliminate transaction costs related to transferring securities from one depositary to the other. Aganbegyan said that creating the central depositary is a major step toward improving the country's financial infrastructure. In another measure, trading in the T+N regime will be launched on the joint stock exchange next year, allowing for a settlement date a few days after the transaction. The practice, which is common on most international stock exchanges, is in partial use on RTS, but most deals in Russia are currently settled on the day of transaction. Despite the successful merger of the stock exchanges' businesses, which valued the combined company's capitalization at $4.5 billion, much work has yet to be done, with integration to be fully completed in 2013, Aganbegyan said. The joint exchange is targeting an initial public offering in 2013, but the final decision on the listing will depend on its shareholders, Aganbegyan said. "We must do much … work to prepare. When we're ready, the board of directors and our shareholders will make a decision on whether we must list or not depending on the market conditions," he said. "At the moment we're focused on being ready to go public by late 2013." Among the shareholders that own more than 5 percent in the joint company are the Central Bank, UniCredit, Vneshekonombank, VTB, Sberbank and Gazprom, according to the bourse's web site. The merger marks the end of competition between the two bourses, allowing them to focus on attracting domestic investors, many of which have been seeking to list outside the country, Aganbegyan said. "By competing we in fact were killing the market for each other, without focusing on very important issues — expanding [the number] of investors … and the work with issuers. … Neither of the stock exchanges was doing this work right," he said. As a result, issuers "left to themselves" were seeking to invest "anywhere but in Russia," Aganbegyan said. Pavel Yemelyansev, an analyst at Investcafe, said the merger alone is unlikely to result in a growing number of IPOs by domestic companies, which favor London to go public largely due to the lack of liquidity on the domestic stock market. But Yezimov of Wermuth Asset Management said the liquidity of the domestic market is likely to grow as more investors gain access to it as a result of the bourses' merger. Among the domestic firms that preferred to list in London was Internet company Mail.ru Group, which raised $1 billion in an IPO late last year. To mark the end of competition between the two bourses, president of the Russian Stock Exchange Union Anatoly Gavrilenko, who participated in the ceremony to launching the joint trade, presented Aganbegyan and former RTS chairman Roman Goryunov — now to be senior managing director of the joint company — with huge bouquets of red and white roses. "The end of War of Roses is being announced today," Gavrilenko said, referring to the 40-year struggle in the 15th century for the English throne between two rival branches of the royal House of Plantagenet that had red and white roses as their symbols.